Archtor has created a new gaming keyboard called the Protean, which the development team say is the world’s first reactive gaming keyboard. Protean Is equipped with an RGB screen and takes the form of a mechanical gaming keyboard that allows each key to be completely customised using the companion application. Watch the video below to learn more about the Protean gaming keyboard and its features and how you can help it make the jump to production by pledging $159 or more via Kickstarter. Let’s be honest, until very recently most keyboards have been one way, input only devices. The birth of RGB colour backlighting and programmable keys allowed for some customisation, but have you ever imagined a keyboard that could react to and change with your input? Because Protean has a screen embedded in every key you can create your own unique interface, modifying key layout and function for any game or app. In-game events like spell cooldowns can generate real-time visual feedback that is displayed directly on the adaptive keys. And this is only the beginning. Protean is a next-gen, high-performance mechanical gaming keyboard, with screens built into keys which are fully controllable using our software, everything from icon design, colour and even the feedback you receive from gameplay. Can you see it? Display vital information directly on your keyboard. Is my base under attack, am I low on ammo, mana, supply? When is my spell ready? Show cooldown timers right where you need them. The only limit is your imagination. The core and central nervous system to Protean. Axonn is the software that lets you customise Protean to your individual play style and needs. 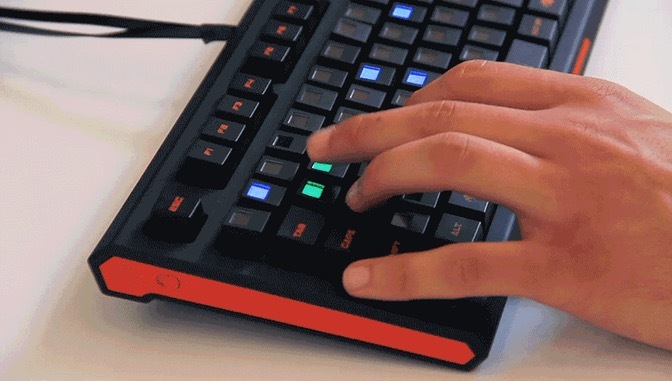 You can control the key layout, RGB lighting, key functions as well as the feedback that you see while gaming. But don’t worry if you’re not big into tinkering and just want to get going, we’ve got you covered with sensible defaults and some background magic so that you can hit the ground running. It fits together quite nicely and here’s how. For more information on the new Protean Reactive Gaming Keyboard jump over to the Kickstarter website for details by following the link below.